Other major projects received funding to conduct research on the next generation of electrified vehicles and to develop new technologies to harvest wasted energy. Ted McMeekin, Minister of Municipal Affairs and Housing and MPP for Ancaster-Dundas-Flamborough-Westdale announced the funding this morning, which is awarded under the Ontario Research Fund program. ‎“McMaster University is doing important research that has a real impact on people’s lives in not just in Hamilton, but the world. I am proud of our government’s role supporting this great work. I want to congratulate all of the well-deserving researchers receiving these competitive awards,” he says. The province is granting more than $3.5-million for research into antimicrobial resistance, which global health agencies have identified as one of the most critical public health challenges of our times. Together, investigators will work to identify new antimicrobial drug candidates, explore the impact of clinical drug use on the evolution of resistance, and build a massive library of tens of thousands of compounds considered the building blocks for drug discovery. 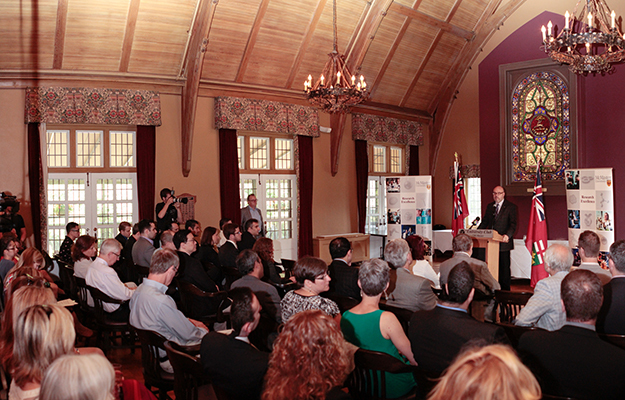 Another major grant –more than $3.5-million—goes to McMaster’s Biointerfaces Institute. The funding builds on 2009 ORF grant that helped establish the Institute. Researchers there are developing new, printable biosensors which can be used in the doctor’s office or in the field to instantly detect bacterial and respiratory infections, among other applications. “The investment by the Ontario Ministry of Research and Innovation, along with that of our partners, will allow Ontario to lead in the development of printable point-of-care diagnostic tests that will provide a means for rapid testing of food, water and diseases,” says John Brennan, director of the Biointerfaces Institute. “The outcome of the project will be a range of inexpensive and easy to use diagnostic test strips that can be used to assess food and water safety and to easily diagnose health status, even at home,” he says. Scientists will work to create a complete system of point-of-care diagnostics that will include all parts from start to finish: sample collection and preparation, detection and readouts, and the ability to manufacture complete test kits at the newly established McMaster-Fraunhofer Biomedical Engineering and Advanced Manufacturing Project Center (BEAM). McMeekin also announced more than $4.4-million in funding to establish the Virtual Electric and Hybrid Electric Vehicle Powertrain Integration Lab (HEPIL). Under the direction of McMaster’s Ali Emadi, who holds the Canada Excellence Research Chair in Hybrid Powertrain, engineers and scientists will research and test the next generation of vehicles with electrified powertrains using a sophisticated dynamometer which can test vehicle force, torque or power. Engineers Jim Cotton and John Preston have received nearly $2-million for the Research Facility for Integrated Building Energy Harvesting Systems (ReFIBES), the only test facility of its kind in North America. Their team will investigate new ways to capture the energy—electrical, thermal or fuel energy—which is lost during transport to our homes and communities. Five other research projects received a total of $683,000 under the Ontario Research Fund-Research Infrastructure program. The province also announced the Early Researcher Awards, a multidisciplinary program that supports early career researchers in an effort to retain the best and brightest talents. Five researchers each received $140,000. Two significant projects aimed at battling superbugs are among those to receive nearly $15-million in research funding, one focused on solving the antibiotic resistance crisis, the other designed to provide instant diagnosis of infectious disease, deadly pathogens and environmental contaminants. Other major projects received funding to conduct research on the next generation of electrified vehicles and to develop new technologies to harvest wasted energy. Ted McMeekin, Minister of Municipal Affairs and Housing and MPP for Ancaster-Dundas-Flamborough-Westdale announced the funding this morning, which is awarded under the Ontario Research Fund program. ‎“McMaster University is doing important research that has a real impact on people’s lives in not just in Hamilton, but the world. I am proud of our government’s role supporting this great work. I want to congratulate all of the well-deserving researchers receiving these competitive awards,” he says. “We are grateful to the Ontario government for recognizing the very real public benefits that can flow from research now underway in McMaster’s facilities, both in terms of public health and economic development,” says Patrick Deane, President and Vice-Chancellor of McMaster. “The people of Ontario would be among the direct beneficiaries of antibiotic discoveries and of widely available point-of-care diagnostics. Both are urgently needed, and both are within the reach of our talented researchers." The province is granting more than $3.5-million for research into antimicrobial resistance, which global health agencies have identified as one of the most critical public health challenges of our times. “Resistance to antibiotics is a challenge of global proportion that is undermining advances of modern medicine,” says Gerry Wright, director of the Michael G. DeGroote Institute for Infectious Disease Research. “We are losing our ability to control infection because microbes are evolving resistance at a faster pace than we are delivering new antibiotics. This funding will help our team find creative ways to solve the crisis.” Together, investigators will work to identify new antimicrobial drug candidates, explore the impact of clinical drug use on the evolution of resistance, and build a massive library of tens of thousands of compounds considered the building blocks for drug discovery. Another major grant –more than $3.5-million—goes to McMaster’s Biointerfaces Institute. The funding builds on 2009 ORF grant that helped establish the Institute. Researchers there are developing new, printable biosensors which can be used in the doctor’s office or in the field to instantly detect bacterial and respiratory infections, among other applications. “The investment by the Ontario Ministry of Research and Innovation, along with that of our partners, will allow Ontario to lead in the development of printable point-of-care diagnostic tests that will provide a means for rapid testing of food, water and diseases,” says John Brennan, director of the Biointerfaces Institute. “The outcome of the project will be a range of inexpensive and easy to use diagnostic test strips that can be used to assess food and water safety and to easily diagnose health status, even at home,” he says. Scientists will work to create a complete system of point-of-care diagnostics that will include all parts from start to finish: sample collection and preparation, detection and readouts, and the ability to manufacture complete test kits at the newly established McMaster-Fraunhofer Biomedical Engineering and Advanced Manufacturing Project Center (BEAM). McMeekin also announced more than $4.4-million in funding to establish the Virtual Electric and Hybrid Electric Vehicle Powertrain Integration Lab (HEPIL). Under the direction of McMaster’s Ali Emadi, who holds the Canada Excellence Research Chair in Hybrid Powertrain, engineers and scientists will research and test the next generation of vehicles with electrified powertrains using a sophisticated dynamometer which can test vehicle force, torque or power. Engineers Jim Cotton and John Preston have received nearly $2-million for the Research Facility for Integrated Building Energy Harvesting Systems (ReFIBES), the only test facility of its kind in North America. Their team will investigate new ways to capture the energy—electrical, thermal or fuel energy—which is lost during transport to our homes and communities. Five other research projects received a total of $683,000 under the Ontario Research Fund-Research Infrastructure program. The province also announced the Early Researcher Awards, a multidisciplinary program that supports early career researchers in an effort to retain the best and brightest talents. Five researchers each received $140,000.